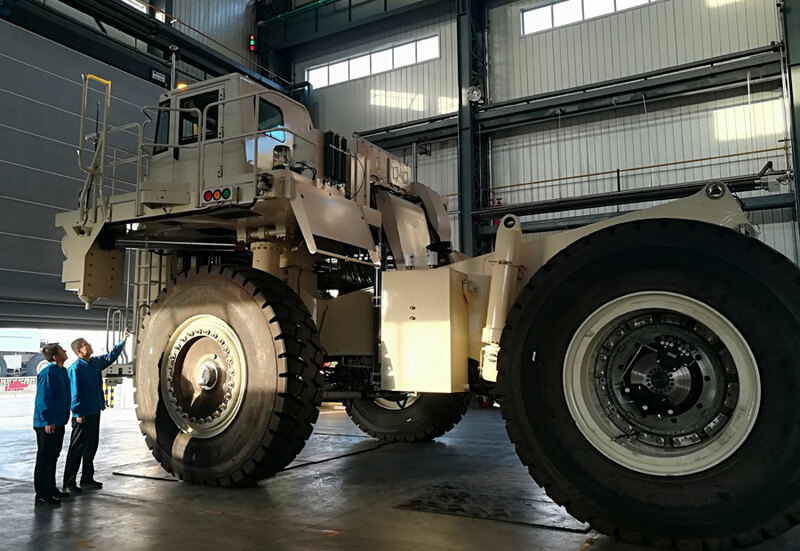 China has successfully produced its first autonomous mining vehicle that can operate 24 hours a day and be loaded and unloaded automatically. The driverless vehicle, developed by Inner Mongolia North Heavy Industries Group Corp, is 12.7 meters long and 5.2 meters tall, with a capacity of 110 metric tons. It can find its way around and identify unloading positions by means of precision satellite GPS, and it can avoid obstacles by using laser sensors and other devices. Its development is the first step in constructing fully automated mines that will reduce costs, boost efficiency and achieve safe production by eliminating dangerous roles for human laborers, according to Wang Fengquan, the project manager. The vehicle is still in the debugging stage and is expected to enter a trial operation in the first half of this year. Traditional mining vehicles require highly experienced drivers to maneuver due to the vehicle's large size and load as well as complex mining terrain, which poses a considerable safety threat to workers tasked with operating the machines in difficult environments. The robotics technology is considered one effective solution to decrease human-vehicle interaction for safer mining. Wang said the machine is equipped with a central controller, GPS, obstacle detection system and 5G communication network system. It starts running on its planned route at a preset speed upon receiving wireless signals from the control center. The design allows the car to accelerate, decelerate, swerve, pull over or call an emergency stop along its planned route without manual control. It can also quickly adjust the route in case of an accident, such as falling ore, to maintain the continuity of the operation. Wang's research also found that seven unmanned cars can perform the same amount of work as nine manual ones. Fuel costs can be reduced by 6 percent and yields increased by 49 percent. In recent years, the Chinese government has tightened regulations aiming to create safer production environments and repeatedly advocated more applications for robots and intelligent technologies in mines to root out safety hazards to manual laborers. China's 13th Five-Year Plan (2016-20) on safe production says that mining enterprises should "replace labor with machines and reduce hands by automation", and a guideline issued by the Ministry of Science and Technology, the Ministry of Natural Resources and the Ministry of Water Resources, has called for wide use of communication, sensing and information technologies to achieve automatic monitoring and control over the entire mining process. "Such smart mines require upgrading and transformation of the entire road transportation environment and the production management system," Wang said. He said his group is currently working with a chain of China's top manufacturers and academic institutions to continue to develop a coordinated data sharing platform that enables better management of these vehicles and creates better transportation conditions for them. "Automated mines are a systematic project and the development of driverless mining vehicles is only the first step," Wang said. "Only when these cars can operate en masse can they create significant economic benefits." China has successfully produced its first autonomous mining vehicle that can operate 24 hours a day.